Our first web site is up and ready to go! 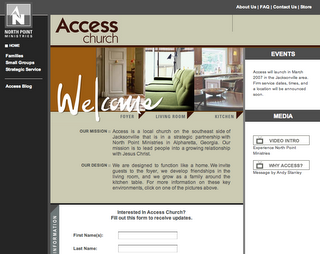 We hope it's a good resource for you to pass on to friends and help them understand Access Church a little better. We're committed to adding new features in the months to come, so please let us know what would be helpful for you as invest in friends and neighbors and invite them to Access environments. For now, you'll be able to view some key video clips, get a better understanding of our foyer-living room-kitchen strategy, and link to the blog and North Point Resources. We hope it helps! This is just a suggestion ---I think it would be helpful to have the dates, location, time and sign up for the informational meetings on the website also.